What a great morning to shop at DeLaurenti Specialty Food & Wine at Pikes Place Market. The girls love shopping there especially for the cheeses. 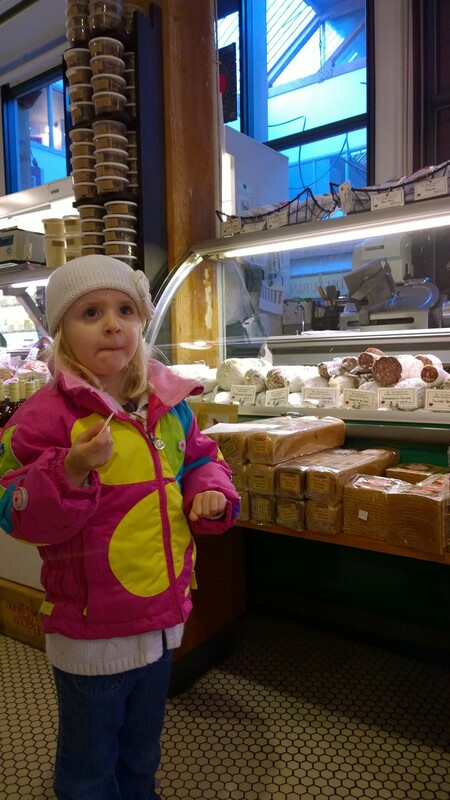 One of my girls loves the Romano cheese and samples are just not enough. I actually have to ask the server to cut a 1″ piece for her and she just devours it before I’ve even paid for it and then asks for more. (I need to start carrying a knife just so I can cut hard, salty and smelly cheese!) If you enjoy blue cheese try the Cashel Blue it is excellent. However it is not always in the store so call ahead. My preference is for the prosciutto – Di Parma (12 month), pair that with fresh and ripe Cantaloupe – delicious. I also enjoy the roasted rosemary, herb ham, their greek feta cheese with a homemade beet salad (Boil beets, fry them up in olive oil with garlic, red onion and a touch of Dijon mustard and then crumble the feta cheese on it) or a tomato salad in the summer. Don’t forget to pick up some Castelvetrano Olives too. Well, while you’re at the market…you HAVE to try Ellenos Greek Yoghurt stand just across the way from there. My kids go crazy for the Passion Fruit flavor..all natural everything, super nutricious, high in protein and surprisingly low in fat!! !